Proponents of high state tobacco taxes point to increased prices as a way to reduce smoking and improve health. After all, they argue, if the price of tobacco products rises as a result of higher taxes, the sales of tobacco products will fall. Source: Mackinac Center for Public Policy. In general, they are right: There is evidence that some people "kick the habit" because of high cigarette prices. Research shows, however, that high state cigarette taxes can have other effects as well. One of these is "casual" interstate cigarette smuggling, in which a single smoker crosses a state border to purchase and carry home relatively small quantities of cigarettes subject to the adjacent state's lower tobacco taxes. Although this cross-border shopping is usually illegal, it allows smokers to continue their habit without bearing the burden of a high state tobacco tax. Moreover, casual smuggling is relatively easy for many consumers. In Michigan, counties bordering another state or country include 28.3 percent of the state's population; in California, 21.8 percent; and in New Jersey, a staggering 61.8 percent. [*] A study published by Michael Lovenheim in the March 2008 National Tax Journal finds, "[B]etween 13 and 25 percent of [U.S.] consumers purchase cigarettes in border localities," and "[C]ross-border smuggling confounds many of the potential health and revenue gains from cigarette taxation." He is not the only scholar to advance this thesis. A more troubling consequence of high state tobacco taxes is large-scale, organized interstate smuggling. Unlike casual smuggling, which usually does not involve ancillary crime, this commercial smuggling deals in large quantities of cigarettes and may include stealing or counterfeiting state tax stamps to aid in the distribution of the illegally imported product. The research performed for this study suggests that commercial smuggling accounts for a significant percentage of cigarette sales. Like casual smuggling, then, commercial smuggling reduces the expected health benefits of higher state cigarette taxes. Unlike casual smuggling, however, commercial smuggling can have a direct and negative effect on residents' health by increasing the risk of violent crime. Higher state cigarette taxes can have a final consequence, though it is difficult to quantify: smokers substituting cheaper "roll-your-own" cigarettes for commercial ones. This "hand-rolled tobacco" may be smoked with or without a filter, thereby regulating the amount of nicotine according to the smoker's preference. These alternative products are usually legal, but obviously undermine the potential health benefits of higher tobacco taxes. Such cigarette tax avoidance and evasion also affect a second goal cited by proponents of high state tobacco taxes: tapping a reliable source of tax revenue. Such revenue is reduced from what it might be by cigarette substitution and by casual and commercial smuggling. Note that policymakers' goals in raising cigarette taxes would seem to be in conflict with each other. Reductions in smoking may improve health, but they reduce sales, and therefore tax revenues, from what they might otherwise be. But this tension is resolved in part by the nature of the cigarette market. In economic terms, tobacco products are "inelastic," meaning that people's consumption of tobacco is relatively insensitive to increases in the price of the product. A review of the economic literature indicates that a 10 percent increase in the price of tobacco generally leads to just a 4 percent decrease in the demand for tobacco. [‡],  Hence, policymakers can usually raise tobacco taxes without producing such a precipitous drop in the sales of cigarettes that overall tobacco tax revenue declines. [§] In effect, lawmakers are often able to hike cigarette taxes and achieve both of their goals at once — smoking declines, while tax revenue increases. Nevertheless, the state of New Jersey recently witnessed a revenue decline after a cigarette tax increase - in this case, in the year following a fiscal 2007 tax hike from $2.40 per pack to $2.575 per pack. Newly available fiscal 2008 data indicate that the net decline has occurred for the second year in a row. [¶] While some of this decline may be due to people quitting cigarettes, some is probably due to increased consumption of smuggled tobacco. In nearby Virginia, cigarette taxes are only 30 cents per pack, making casual smuggling attractive to New Jersey smokers, and as we will detail later, large-scale bootlegging probably plays a role too. Much has been written about tobacco products from the perspective of a person's individual health and the cost of providing Medicaid-related health care to tobacco users. This field of research has been both valuable and necessary. There has been, however, a relative dearth of widely disseminated research discussing the consequences of cigarette taxation. This study attempts to fill that void in two ways. 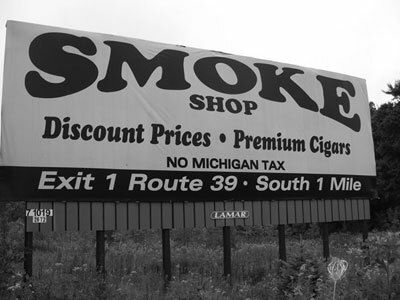 The first is a historical perspective on state tobacco taxation, cigarette consumption and cross-border smuggling, particularly in Michigan, California and New Jersey. All three states are populous and vulnerable to cigarette tax evasion due to their location and policies. In discussing these states, we recount numerous — and often fascinating — instances of cross-border smuggling to help demonstrate the nature and the scope of the difficulty faced by high-tobacco-tax states. The second element of this study is a new econometric analysis that uses recent data to estimate the degree of casual and large-scale smuggling activities in each of 47 contiguous United States. [**] The results of this economic model are statistically robust and generally consistent with the findings of other researchers. The general reader should not recoil from this discussion; we have rendered the findings in reasonably plain English and placed the technical work in an appendix. As with the cigarette tax history we recount, the results of the econometric analysis suggest certain limitations on policymakers' efforts to improve public health and maintain a reliable revenue stream through tobacco taxation policy. Frank J. Chaloupka, Teh-wei Hu, Kenneth E. Warner, Rowena Jacobs, and Ayda Yurekli, "The Taxation of Tobacco Products," Tobacco Control in Developing Countries, ed., Prabhat Jha and Frank Chaloupka (City, State. : Oxford Medical Publications, 2000); Taking Action to Reduce Tobacco Use, National Cancer Policy Board (National Academy Press, Washington, DC: 1998), (http://www.nap.edu/ openbook.php?record_id=6060&page=R1); U.S. Department of Health and Human Services. Reducing Tobacco Use: A Report of the Surgeon General. Atlanta, Georgia: U.S. Department of Health and Human Services, Centers for Disease Control and Prevention, National Center for Chronic Disease Prevention and Health Promotion, Office on Smoking and Health, 2000 (http://www.cdc.gov/tobacco/data_statistics/ sgr/sgr_2000/#full). Michael F. Lovenheim,"How Far to the Border? : The Extent and Impact of Cross-Border Casual Cigarette Smuggling," National Tax Journal LXI, no. 1 (March 2008): 1. HM Revenue & Customs (HMRC) Departmental Report: Integrating and Growing Stronger, Spring 2007, 39, http://customs.hmrc.gov.uk/ channelsPortalWebApp/channelsPortalWebApp.portal? _nfpb=true&_pageLabel=pageAboutUs_ShowContent& propertyType=document&resetCT=true&id=HMCE_PROD1_027505 (accessed Sept 16. 2008), 39. Chaloupka, Hu, Warner, Jacobs, and Yurekli, "The Taxation of Tobacco Products," 237. William Orzechowski and Robert Walker, The Tax Burden on Tobacco, Historical Compilation 42 (2007): 10. [*] Author calculations and "County Population Estimates," United States Bureau of the Census, http://www.census.gov/popest/counties/CO-EST2007-01.html (accessed September 21, 2008). The Michigan and California calculations include counties bordering not just U.S. states, but also Canada and Mexico. The New Jersey calculations include counties connected by a bridge or tunnel with the state of New York. These bridges and the adjoining counties were identified using maps at Google Earth. [†] As discussed later, a state will typically require all cigarettes sold within its borders to display a state tax stamp. The stamp, available only from the state government, indicates that the state tax on the cigarettes has been paid and that the cigarettes can be legally bought and sold. Bootlegged cigarettes cannot display this stamp and therefore cannot be used in legal commerce, but they may nevertheless be attractive to retailers and consumers when their price is significantly lower due to the absence of a high state tax in the price. We are careful in the text to distinguish between casual and commercial smuggling wherever necessary; we sometimes refer to commercial smuggling as "bootlegging" or "large-scale" smuggling. [‡] We should add that while the overall demand for cigarettes is highly inelastic, it is not inelastic for all consumers. Smokers are much more responsive to price along borders with other states, other nations and other jurisdictions (such as military bases and Indian reservations) where tax differentials exist. These smokers have easy access to low-cost substitutes for the high-priced cigarettes they would purchase legally in-state, and hence the demand for cigarettes is more elastic near these borders. [§] To appreciate the contrast between tobacco and elastic goods, consider the outcome if policymakers placed a heavy tax on green peppers. The subsequent demand for green peppers would plummet as people used red peppers, yellow peppers or another vegetable in their cooking — or simply ate fewer vegetables altogether. In this case, the decrease in demand for green peppers would likely be so high as to put the actual tax revenue significantly below the revenue that might have been expected when the tax was levied. If the tax on green peppers were raised again to make up the shortfall, the demand for the item might drop enough that the total revenue from the tax might decline, rather than rise, despite the higher tax rate. [¶] Greg Edwards, Center for Policy Research of New Jersey, telephone interview with Michael LaFaive, September 26, 2008. Citing official state statistics, Edwards reports that cigarette tax revenues dropped from $765.1 million to $763.4 million from fiscal 2007 through fiscal 2008. This prolonged revenue decline challenges the common view that tax revenues may sometimes drop immediately following a cigarette tax increase, but will increase again after smokers become accustomed to the new price. [**] Of the 48 contiguous U.S. states, only North Carolina is omitted, due to the unique role it plays in our statistical model.